Situated in our lush, leafy gardens next to the reception area, Anurak Lodge Hornbill Restaurant is within easy reach of all our bungalows. 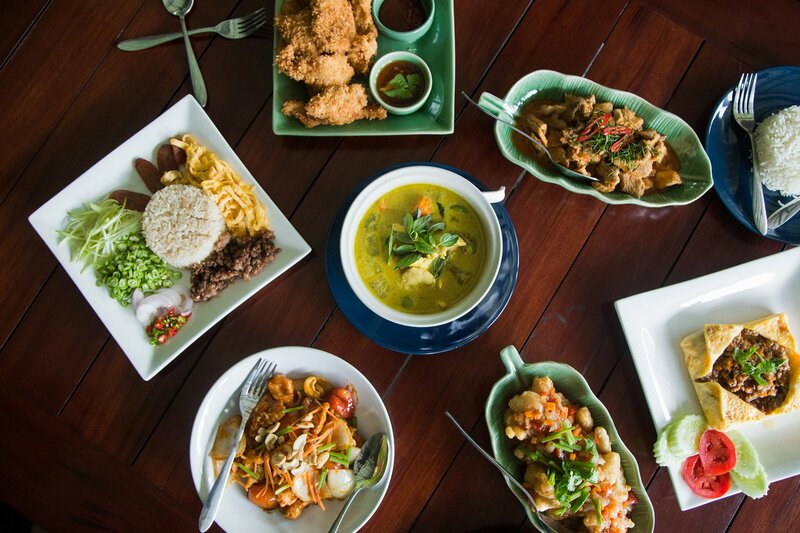 In fact, you could say that all paths at our Khao Sok eco-lodge lead to Hornbill Restaurant, because not only is it a place to enjoy delicious Thai food, it’s a great spot to pass the time and get together with friends and family. 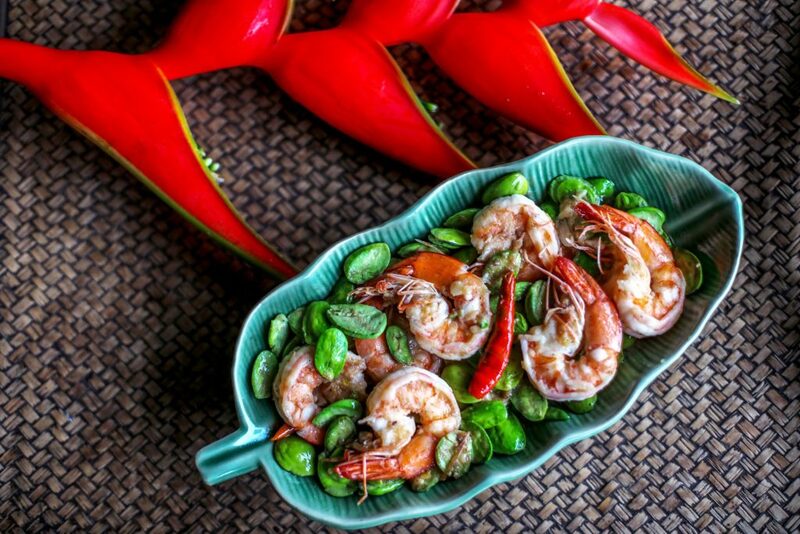 What makes Hornbill Restaurant particularly special is its location. With its high roof and simple open-plan design, Hornbill Restaurant provides guests with a real sense of space in harmony with the natural forest surroundings. 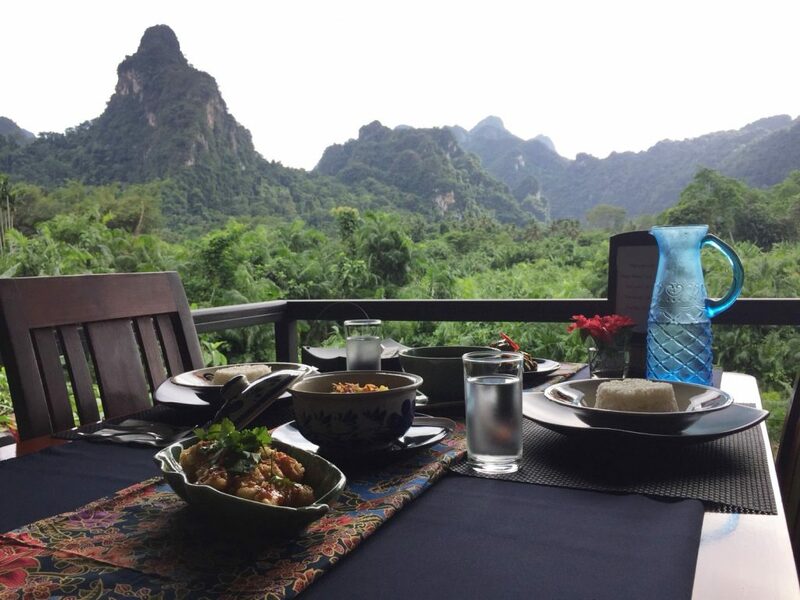 Be prepared to be truly amazed by the awe-inspiring view that meets you as you sit down for your first meal at Hornbill Restaurant: Beyond the Sok River, the Khao Sok jungle rises gradually like a rolling green carpet to the towering limestone mountain peaks of Khao Sok National Park. All you can see is jungle wilderness – a truly remarkable sight! Hornbill Restaurant provides seating for up to 50 guests and serves breakfast, lunch and dinner. 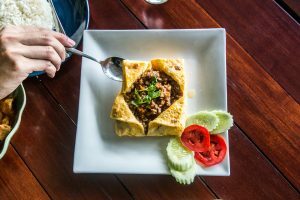 Our menu offers guests a nutritious selection of Thai dishes prepared using natural ingredients and fresh vegetables sourced from the local market, and where possible, from our own gardens. Try one of our delicious Thai Signature dishes like Khao Kluk Kapi – stir-fried rice topped with sweet pork, long beans, shallots, green mango, chilies and cucumber; Kai Yad Sai – stuffed omelet; or Pad Thai – a popular stir-fried dish made with rice noodles and egg, bean sprouts, green onions, ground peanuts, and your choice of chicken or shrimp. 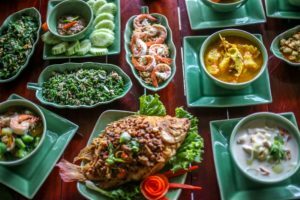 We also have popular Thai favorites like Gaeng Keo Wan – green curry with eggplant and chicken, or Tom Yum soup, which brings together the flavors of lemongrass, galangal, kaffir lime leaves, fresh Thai chilies and lime juice – all combined to create a healthy and soothing broth. If you have any special dietary needs please inform us in advance and we will try our best to accommodate your requests. 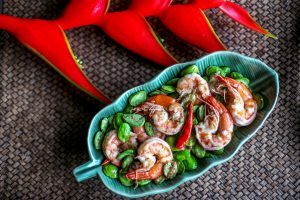 Some Thai dishes – especially southern dishes – can be very spicy, so we take care not to make them too fiery unless instructed otherwise! As dusk falls and the orange sun sets behind the mountains, kick back and enjoy a few drinks at the restaurant’s Cloud Season Bar. We have a broad selection of beers and spirits, and you can also try one of our exotic cocktails like ‘Anurak for Him’, made with Malibu and Bacardi, or ‘Anurak for Her’, a mixture of Bacardi, Rum and exotic fruits. Grab a bar stool and sit with your family or friends, overlooking the Khao Sok jungle, listening to the eerie murmurings of the forest as it comes alive with the nocturnal foragers and hunters. You may even catch the magical whooping of the gibbons echoing through the tall tree tops as they settle down for the night in the jungle canopy. Loved the food and the cocktails were nice and most of all the views while having the meals and drinks! One of our finest accommodations @ our trip thrue Thailand. What do you get? an comfortable luxe lodge with a stunning view, great Thai food, crew members with a smile. If you have ever worried about how you would cope with the Thai food, this is an excellent start point, beautiful, aromatic, simple, light, satisfying, spicey not too spicey. Perfect! The food was excellent a great variety every day and the staff were all very friendly and helpful. The restaurant serves a wide variety of meals including delicious traditional Thai food. We spent 3 great days there. Beautiful place naar Kao Sok national park. Beautiful nature, cosy and very clean lodges, a nice bar with excellent food. The cooking is marvellous and delicious! Compliments. During happy hour very nice and well-prepared cocktails. The cottages are simple (basic) but well equipped: good bed, shower, airco, fan. And last but not least: the food, it really is very tasteful! The cocktails at the bar were amazing, (personal recommendation the Mai-Tai’s), the food was amazing – with generous portions, which far surpassed even our expectations…..I myself am a vegetarian, and found parts of Thailand difficult to get a decent meal (that wasn’t same every single time), but Anurak Lodge catered to literally any dietary restrictions. An amazing 2 night stay here as part of our honeymoon! Absolutely stunning scenery, scrumptious food and lovely accommodation! The onsite restaurant was the only place thus far on our time in Thailand we ordered food and got what we wanted every time. The pad thai was one of my favorites and maybe the fourth time ordering it since in Thailand. (When in Thailand eat Thai food!!) Oh and we were treated to an authentic Thai breakfast one morning which was delicious.